I love Polish sausage. There's something about the mild spiciness of this meat, the crisp casing that snaps when you bite into it; the juiciness of the sausage that explodes in your mouth that is simply perfect. They are delicious boiled, broiled, roasted, grilled, or sautéed. I like them plain, served with coleslaw, on hot dog buns layered with mustard, baked in casseroles, and this way: hot and juicy, sliced and placed on top of the perfect potato salad. The potato salad, of course, must be My Mother's Potato Salad, the recipe that she got from her grandmother. This recipe is very simple but must be followed to the letter. You must use red potatoes and boil them. They are peeled after cooking, and added to a velvety sauce made of mayonnaise, Miracle Whip salad dressing, milk, and mustard. That's it! Its simplicity highlights all the flavors of the ingredients. I have never served it to anyone who hasn't loved it. Top that cool and creamy salad with spicy, hot and juicy sausage for a wonderful treat. This is the perfect recipe to ease you from summer into fall. 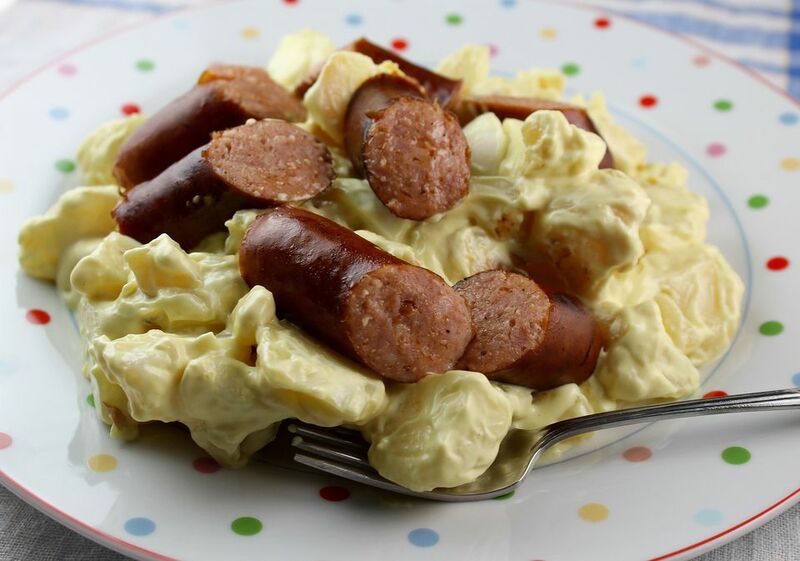 You get the wonderful soft flavor of the potato salad, the classic summer salad, with the crisp bite of the warm sausages. I can't think of a better combination for dinner. All you need to serve with this salad is some fresh fruit and perhaps some crisp breadsticks or onion scones. Or homemade crackers. A cold frosty bottle of beer is the perfect drink, or maybe some cold lemonade served over ice. For dessert, chocolate chip cookies or ice cream sandwiches would be perfect. Prepare the potato salad the night before. It needs some time to gather itself and for the flavors to blend and meld. That's okay - this is the perfect make ahead recipe, since cooking the sausages takes just a few minutes. Put the sausages into a cold skillet and add 1/2 cup of water. Place the skillet over medium high heat and bring to a boil. Turn the sausages occasionally and shake the pan until the water evaporates. Now the sausages will begin to brown and sputter. Keep shaking the pan until they are well browned, hot, and juicy. This should take about 10 minutes total. Remove the sausages from the pan and place on a plate. Let stand for a few minutes so the juices redistribute. Then slice the sausages on an angle. Put the sausage slices on the potato salad and serve immediately.